Cycling remains a popular sport for both recreation and competition. 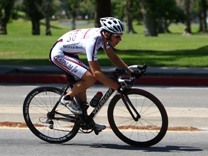 Many runners and other endurance athletes use cycling as a form of crosstraining and recovery from hard training sessions. However, too much of a good thing can cause injury just like any other sport. Overuse injuries, although relatively rare compared with running athletes, do occur in cyclists. Many experts believe that errors in riding position and ill-fitting equipment are the biggest contributors to the development of overuse injuries. Many high quality bike shops or endurance training centers can evaluate the fit of the bike to the individual, including seat positioning and individual riding style. These bike-fitting evaluations can also be used to improve body position which in turn may improve overall performance. In addition, the science of cycling training has advanced in the last decade due to the use of heart rate monitors and power output meters. These measurement tools allow for precise monitoring of the athletes performance, and can be used to optimize training, and avoid physiologic training overload, which may lead to loss of conditioning and performance. The use of these tools, when combined with bike fitting, have provided a more evidence base approach to performance improvement..